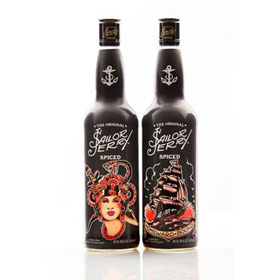 William Grant & Sons is set to launch a series of limited edition flash art bottle wraps and cups for its Sailor Jerry rum brand. Based on flash designs from the “undisputed father” of old school tattoos, Norman ‘Sailor Jerry’ Collins, each of the four new designs – the homeward bound ship, an American eagle, a pin-up girl and a Gypsy – holds a specific meaning. The range itself is said to be “inspired by brotherhood, embodying freedom of expression and showcasing the craft of old school tattooing”. The gypsy design represents “good fortune”, while the ship is “practical, patriotic and metaphorical” – tattooed on sailors as a reminder of home. The eagle is a symbol for America, and represents “honour, prowess and intelligence”, while the pin-up girl design – arguably Sailor Jerry’s most iconic – represents the “ideal and extremes of femininity”. Dave Hort, senior brand manager of Sailor Jerry, said: “We wanted to provide our consumers with a collectable run of new bottle wraps based on the great, iconic works of our founding father Norman Collins. Released exclusively in the UK and Australia, the first two designs will hit shelves from April, with the second two designs to follow later in the year. The wraps will be available in all major retailers at an RRP of £20.